This week we've been talking about bioremediation, how bacteria can be used to clean up environmental damage in soils and mining waste. But can the same techniques also be used in our oceans? Joel Kostka is from the Georgia Institute of Technology and investigated in how microorganisms played a role in cleaning up the aftermath of the Deepwater Horizon Oil Spill in 2010. Joel - In the past, the accidental release of oil into the environment largely occurred by tankers running aground and breaking up into shallow water. But in recent times, oil tankers have become much better designed. And so, even if a tanker runs aground, there's less of a chance for that ship to break apart and release oil into the environment. So more and more, what we're seeing is oil is released from pipes, associated with these floating oil rigs like the Deepwater Horizon rig in the Gulf of Mexico that drill through miles of seawater and miles of ocean floor. What we say in our field now is that it's not a matter of whether we will have another major oil spill. It's a matter of when. Chris - When the disaster happened with Deepwater Horizon, how much oil was actually being lost or discharged into the Gulf of Mexico? Joel - The total oil released was about 5 million barrels of liquid oil and one third as much again of natural gas is released into the deep ocean. So, we're talking about over 6 million barrels of oil equivalents were released into the ocean. Chris - Now, you work on microbes and how they are affected and how they affect oil and water. So, when you go and look at a sample of water from the Gulf of Mexico, are the ocean waters richer in bacteria there that will naturally be able to degrade oils? Joel - Certainly. So, one of the unique aspects of the Gulf of Mexico is though it's vast, it still is relatively small ocean basin, into which a lot of oil is deposited from natural oil seeps. And so, if you take samples with the submarine or another device around where that oil is seeping out, you will indeed see a concentration of microbes that have evolved to take up and eat that oil. Bacteria that have evolved to eat oil carry out what's called a respiration process. They breath oxygen and burn the carbon that present in the oil. So, oil is an excellent food source for microorganisms. Chris - And so, the logical question for me to ask is, given that those bugs are there, can you recover them, enrich them and then use them if there is another oil disaster to help degrade the sleeks in some way? Joel - I wish that was the case, that it would be that simple. There's really credible evidence that indicates any organism that we can grow in the lab and add into the environment that would do a better job of degrading oil hydrocarbons than the indigenous or native communities. The reason for that is that the microbial communities that are present naturally in seawater or at the seafloor are adapted better to those environmental conditions that are there than anything that we can add. Chris - What are these microorganisms? What sorts of bacteria are they? Joel - Some of the best known organisms that we've studied so far are members of what we call the gammaproteobacteria and just from their names, you can tell that they're good at breaking up oil for example. Probably the best studied organism worldwide is called alkanivorax. It's named alkanivorax because it eats alkanes. Another organism would be called (marinobacteriahydrocarboneclasticus) and again, an organism that breaks apart hydrocarbons. Chris - Now, in a human context, if I had an unsettled stomach or I'd had a course of antibiotics which had wiped out the bugs that naturally live inside me and help me breakdown my dinner, I could supplement myself with some bugs or eat certain foods which would encourage certain microorganisms to increase in number. Can we do the same thing in the ocean? Knowing that we've got in our pollution problem, could we help to bioremediate by fertilising the right sorts of bugs in order to encourage them to breakdown the nasty stuff faster? Joel - That's a good question. So, in the response to the Exxon Valedez spill, the largest response that was undertaken was to fertilise beaches that were impacted by oil. Certainly, it was observed that the oil was degraded faster than it would've been if the beach had not been fertilised. But it remains controversial as to whether that remediation strategy was really effective because the oil probably would've broken down naturally without fertilisation. And whenever you add nutrients to the environment, you can potentially cause some unintended consequences like for example harmful algal blooms. 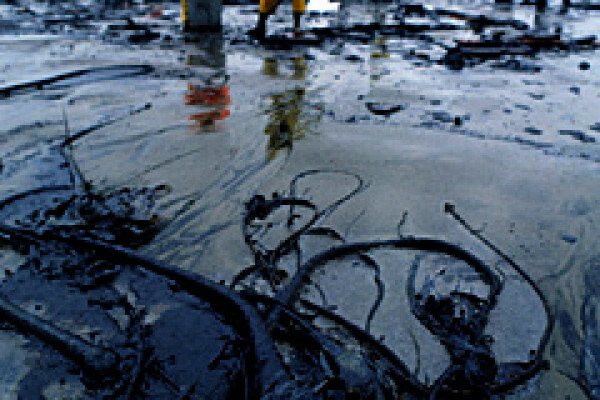 Chris - So, what would you say the bottom line is with respect to the use of microbes in cleaning up oil spills? Joel - I would say that the use of microbes in cleaning up oil spills is that natural microbial communities provide ecosystem services really all over the globe, it's a supply and demand issue. As long as the release of oil into the Gulf of Mexico is slow enough, natural microbial communities can keep up and degrade any oil that's released into the environment. It's only when you have a huge amount of oil released in a short period of time. So, much higher supply that it outpaces the demand and the microbes can't keep up. But eventually, that oil will be degraded naturally. It actually occurs fairly rapidly in the presence of oxygen and in the presence of sufficient nutrients. Is there a reliable way to make salad vegetables safe without cooking them?